Save money, time, and hassle of buying costly, bottled water and live healthier with ultra-safe water that is contaminant free. Surblue 6-Stage Reverse Osmosis Water Filter delivers high quality clean, filtered drinking water at an affordable price. 2.Before first use,run cold water for 5 minutes in filtered water position. 3.First use, the water came out black for a second, because there is granular carbon in the filter. 4. During filter flush, it is normal to see cloudy water and hear sound of water pushing air out of the filter cartridge. Six-Stage Filter: Ceramic Filter Layer+ Medical Stone+ Weak Alkaline+ Calcium Sulfite+ Tourmaline+ Activated Carbon, Filter Accuracy 0.1 micron, remove up to 99% of contaminants including arsenic, chlorine, lead, fluoride, heavy metals, bacteria, virus and 1000+ contaminants, leaves these essential minerals. 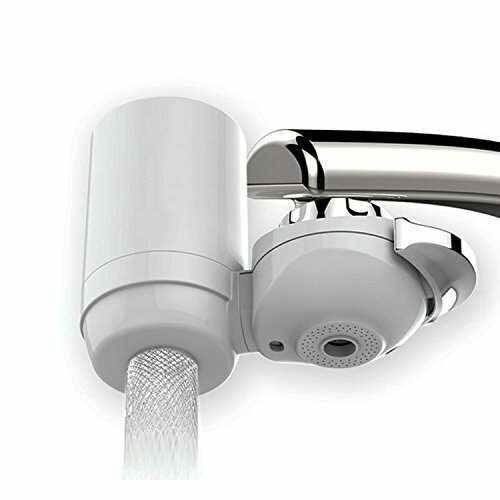 Three Outlet Water Pattern: Purified water outlet/One-Through water pattern/Shower water Pattern. Lasts 500 gallons water - Which is about 6 months (depending on water quality & usage). The package including adapter and different types of joints, suitable for all the water taps. If you have any questions about this product by Surblue, contact us by completing and submitting the form below. If you are looking for a specif part number, please include it with your message.